"BREAKING NEWS! When LYING LIB MEDIA makes up FAKE NEWS to smear me, the ANTIDOTE is go right at them," Clarke wrote. "Punch them in the nose & MAKE THEM TASTE THEIR OWN BLOOD. Nothing gets a bully like LYING LIB MEDIA’S attention better than to give them a taste of their own blood #neverbackdown." Former Milwaukee County Sheriff David Clarke Jr.
Milwaukee County Sheriff David Clarke Jr. departs after a meeting with U.S. President elect Donald Trump at Trump Tower New York, U.S., November 28, 2016. Republican U.S. presidential nominee Donald Trump talks with Milwaukee County Sheriff David Clarke Jr. at the Milwaukee County War Memorial Center in Milwaukee, Wisconsin August 16, 2016. Milwaukee County Sheriff David Clarke salutes at the Republican National Convention in Cleveland, Ohio, U.S. July 18, 2016. Milwaukee County Sheriff David Clarke Jr. arrives to meet with U.S. President elect Donald Trump at Trump Tower New York, U.S., November 28, 2016. Republican U.S. presidential nominee Donald Trump talks with Milwaukee County Sheriff David Clarke Jr. (L) and former New York mayor Rudy Giuliani (R) at the Milwaukee County War Memorial Center in Milwaukee, Wisconsin August 16, 2016. Sheriff David Clarke speaks before republican presidential nominee Donald Trump during a rally at the KI Convention Center on October 17, 2016 in Green Bay, Wisconsin. Milwaukee County Sheriff David Clarke flashes a peace sign at the Republican National Convention in Cleveland, Ohio, U.S. July 18, 2016. 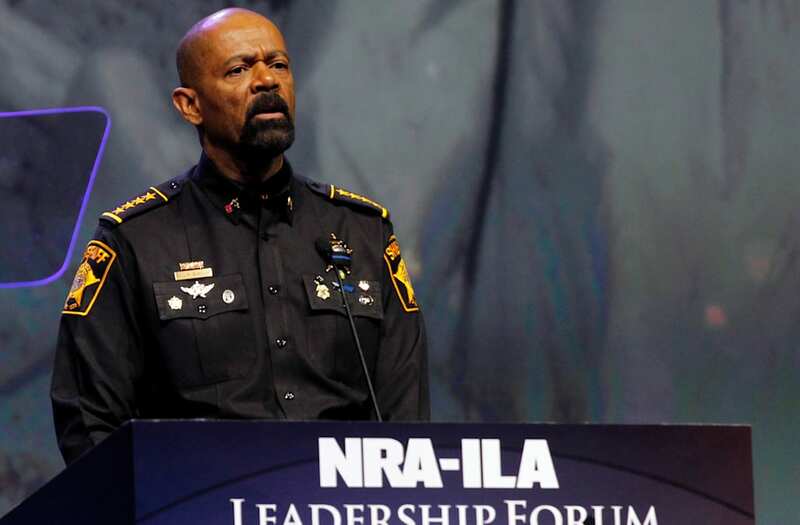 Sheriff David Clark addresses members of the National Rifle Association during their NRA-ILA Leadership Forum at their annual meeting in Louisville, Kentucky, May 20, 2016. Milwaukee Sheriff David Clarke (L) exits elevators after meetings with President-elect Donald Trump November 28, 2016 at the Trump Tower in New York. Milwaukee Sheriff David Clarke speaks during the National Rifle Association's annual meeting in Nashville, Tennessee April 10, 2015.